When it comes to celebrating events, having some alcohol there seems to be a good idea. It calms some people down while reducing some nervous tensions. It's done at weddings, businesses, or some sort of personal events that the clients want, which is why Elkhart Catering is in business. 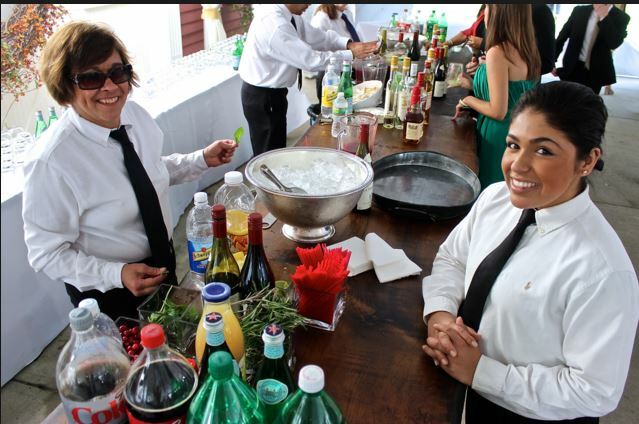 By providing a bar service to the events, they could help cater to people that want some alcohol while they are there. In some cases, it is a way to help people network with one another either as friends, family, or work-related people that the client invited. They provide wine and bar service because they enjoy what they do. There are a variety of wine and alcohol to choose from. The staff members provide what the people want while being warm and friendly to whomever they interact with in any type of events that they're working in. They have a bar catering license to prove that they value people who appreciate and took the time to hire them for this purpose. A bar service menu is provided as well. The clients get to decide on what to add to the menu because it depends on the event and who it was for. A wedding is an exciting time for the bride and groom to celebrate their new life together. Although it can be scary, the excitement makes it even more fun and great for the couple to enjoy each other more. Delicious food, wonderful people, and a great place to announce their love together. Nothing is better than this when it comes to creating a life together as a couple. Catering for weddings is one of the many ways of the top services that are provided by the service industry. A bar catering contract is necessary to have ahead of time to sign, which should state what rights the clients and customers have and to agree on things before the event happens. Without a contract, words get lost, and this is when trouble begins. You need a document showing proof of what the customers and Elkhart Catering said they will do while on location during the event. When it comes to work, celebrating their employees' achievements and what they contribute to the company is a great way to let them know that they are valued at work. Unfortunately, not all businesses do this, but it should be a reminder that people like being valued for working at a certain company and is a great way to convince them to stay with them instead of going elsewhere. As you can see, the Elkhart Catering company is a bar catering business within the Elkhart community. Weddings and companies celebrating the employees' contributions and successes are few, out of many events, needed more than anything. The nice feature as well is the catering bar menu that is made ahead of time, which will avoid any major problem because it covers what people want due to the customers' input. The taco bar catering is a nice thing to have, no matter what the celebration may be.